As promised: young monks in the park waiting for the end of the processional of the arriving Je Khenpo and the attendant monk body. 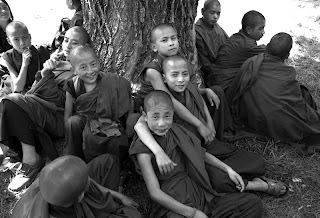 The first image should dispel any doubts you may have had about little monks...they are, afterall, little boys. And then the monks arrived. 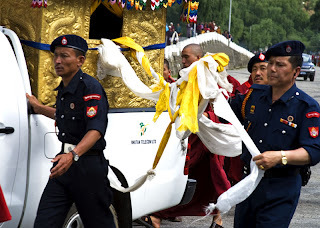 We were told the Je Khenpo was not feeling well and not part of the processional. I imagine this was a bit of a disappointment to the crowd gathered but there was, nevertheless, plenty blessing to go round. 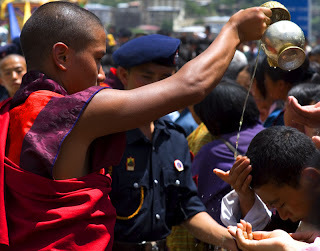 Monks gave blessings to and poured oil on the head of every single person. 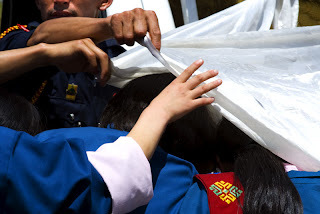 In addition to that, a blessed "scarf", a long piece of sheer cloth from the golden shrine to the Buddha that was mounted on the bed of a small truck, was passed over every head. 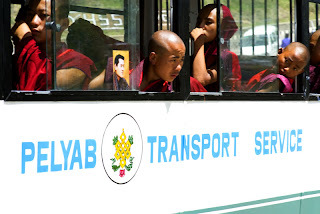 There were several large buses transporting monks as well. In the first picture you will see, mounted to the window of the bus, a picture of the king. The king and the Je Khenpo share equally the responsibility of governing the country. They are both revered as dieties. Over a period of about 2 1/2 hours the processional traveled about 2 miles. It ended finally at a specially prepared site where the welcoming ceremony took place. Only monks and officials of the highest order were allowed into that site. Next I will show you some pictures from the park. 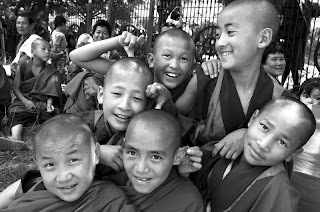 It was really a happy place and startling too with little robed monk trainees running around, giggling and even debating. 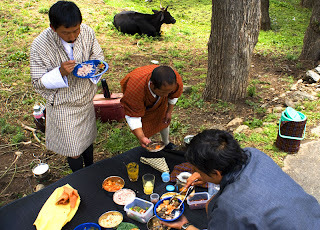 Bhutan - Monk Body Returns to Thimphu - BUT FIRST LUNCH! While waiting for the arrival of the monk body we took a quick respite for lunch. 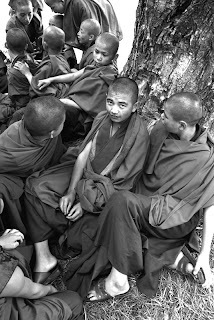 We did not want to stray too far from the road where the monks would first approach. We felt quite fortunate to find this bit of land just above the gathered crowd and just beyond the tethered bull. 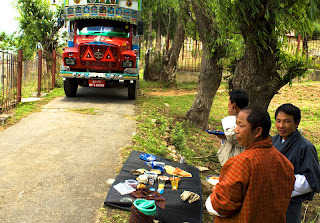 In hind site we really should have invited the driver of the very large and very colorful truck to join us seeing as how he expertly missed our picnic site by mere inches. The monk body associated with the Je Khenpo, Bhutanese buddhists equvalent to the Roman Pope, spends the winter month in the large and beautiful Punakha Dzong situated in the warm southern part of the country. 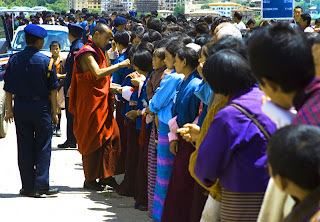 Sometime in May the monks and the Je Khenpo return to their summer residence in the capital town Thimphu. 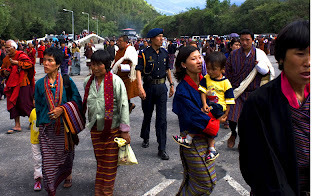 The return is a significant and celebrated event for the residents of Thimphu. 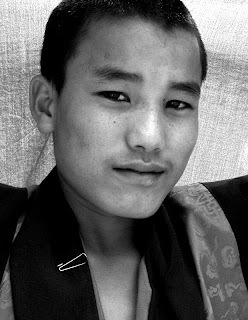 The journey from Punakha had taken many days. 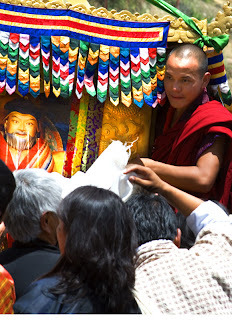 In each town the monks passed through, they stopped to bestow blessings to the people they found waiting there. 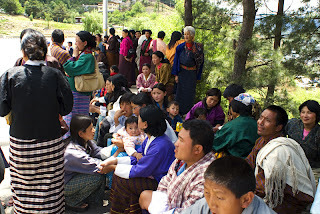 The day the monks were to arrived in Thimphu was hot and very sunny. By nine in the morning school children, in the uniforms worn for special occassions, lined the street. Very soon after that other groups and individuals began lining both sides of the main road. I am sure the formal kiras and ghos that everyone was wearing made it seem even hotter. Although it was uncertain just what time the arrival would take place and despite the heat, the people waited patiently. The wait for most was about a four hour one. 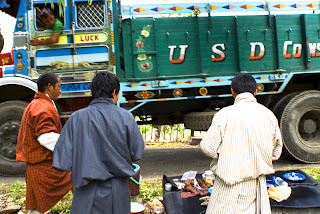 At noon we - Tashi, Ugyen, Tobgay* and I - went in search of a spot for our lunch the lunch that we had brought. * You have met all three in previous posts. While I did not attend a festival on this visit to Bhutan, I was able to see festival dancers at the very large, very significant return of the monk body to Thimphu. 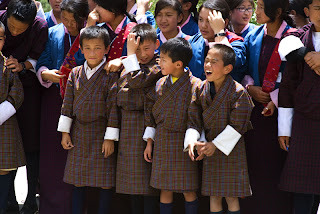 ( I wrote about this event actually from Thimphu. If you scroll all the way to the bottom you will see that post). I will tell you more about the return tomorrow and, of course, post lots of pictures. For now, though, a festival dancer waiting for the dance celebrating the return to begin. 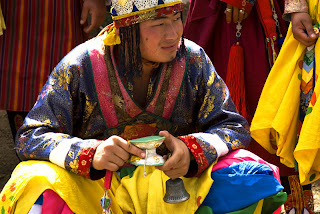 He, by the way, is not holding a cup of tea but an accessorie to the sacred dance. 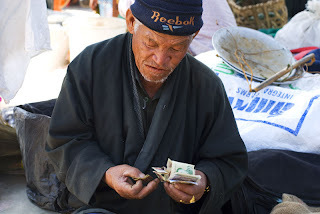 More images from the weekend market in Bhutan's major town, Thimphu. Reebok gets around. Somewhere I have a shot of a little boy in Barskoon, Kyrgyrstan in the same cap as seen on the gentleman above. Ok. I LOVE markets. 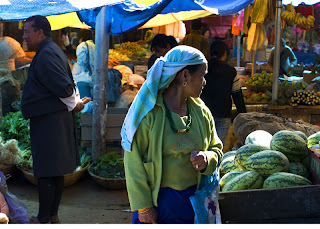 This weekend market is in Thimphu. There is another smaller one in Paro. 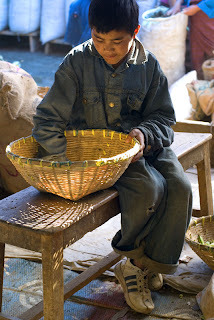 Both markets are fine examples of the sustainable economy aspect of GNH. 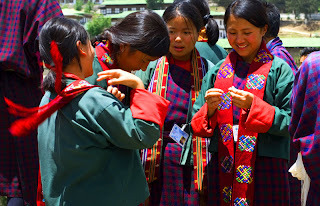 Bhutan is an agrarian society. 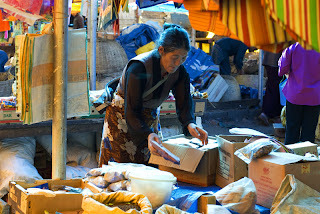 Depending on the seasons all sorts of vegetables, strange herbs and spices can be found in the markets. Fruits come from the orchards in the southern part of the country, vegetables like potatoes and yams from the north and central sections. 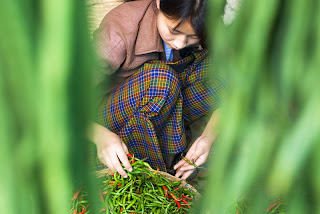 The center picture above is shot through a dense curtain of green chili peppers as the woman was arranging more this Bhutanese staple in a bowl. More often than not hoooooot peppers are the dish and not the added spice for a bit of a kick. As in most markets there is a section items for sale that some might purchase for gifts to take home. 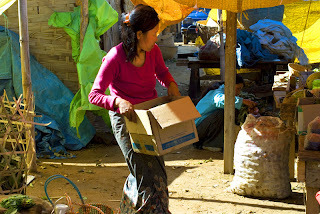 While the venders are surely happy to sell these wares to visitors, the products - religious objects, cloth, baskets, jewelry - are meant for local use. There really isn't a tourist market in western tourist terms. Which is great!